Discuss work plan, agenda for coming weeks, next steps etc. Apologies for the short notice. We’ll announce meeting times more ahead of time starting next week. If you can’t make Friday’s call but would like to get involved, please leave a comment below or contact us, and we’ll get back to you. Thanks! For the first few years since its founding in late 2010, IAP2 USA has been operating under fairly significant resource constraints. As a relatively small organization, and with most of our revenue still coming from member dues, our overall budget has been very limited. Many key initiatives and services wouldn’t be happening if it wasn’t for the amazing work of our volunteers. While a successful 2013 North America Conference and advances in other areas last year have helped stabilize the organization, a number of fundamental challenges remain. The good news is that for the first time in many years, we finally have the bandwidth to tackle these long-standing issues head-on. To this end, the Board recently approved the creation of a new Strategy and Fundraising Committee, whose goal it is to help improve the overall financial health of the organization. Our efforts will build on the important work that was done by the Strategic Planning Task Force last year, whose updated strategic plan (DOCX) was approved by the Board in December. If this is you, and if you have roughly 3-10 hours to spare per month over the next four months, please join the team! If you plan to attend, or if you’d like to be notified about future meetings and opportunities to contribute, please RSVP by adding your name and contact info to the list or contact our staff. Any comments or questions, please leave a comment below. Your Professional Development is Important to Us. Did you know that we record all of the monthly learning webinars? Well, we do. We know that some of you are unable to join us on the day and we feel that it is important to share the wisdom and experience of our learned presenters. .
Have you ever wondered about? Check out the webinar links and the archive! And don’t forget to join us every second Tuesday for our interactive learning webinars. For webinar recordings visit our webinar page. The membership task force had its first call last Wednesday. Members can follow our progress and contribute via the wiki (if you require access, please contact us). This task force is on track to completing its work by the end of November. If you’d still like to join, please complete the volunteer sign-up form, and we’ll contact you. Thanks! 2013 Membership Task Force: Call for Volunteers! IAP2 USA is a membership organization, and our continuing success depends to a large degree on how well we serve and grow our membership base. At the recent in-person Board meeting in Salt Lake City, UT, the Board agreed to set up a membership task force to re-focus our efforts in this area. In addition, we will thoroughly estimate our 2014 resource needs and develop suggestions for improving the ways the membership team interfaces with our other committees, our members, and our staff. Expect to attend 3-4 conference calls. For online collaboration in between meetings, we will rely on email and the IAP2 USA wiki. If you have membership development experience, we need you! This is a great opportunity to get involved for a limited time and just see what it’s like to work with us. Please use our online form to sign up or to learn more, and we’ll share dial-in details and our draft agenda with you. 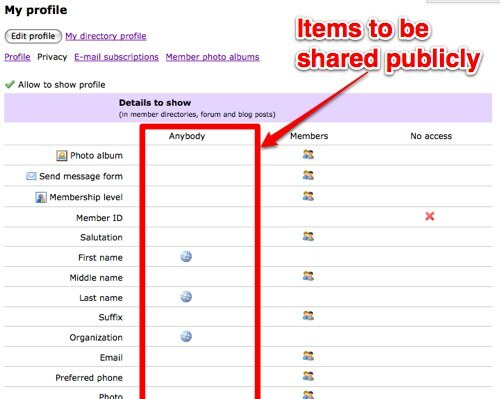 Under privacy setting “Profile access / Show profile to others”, all members whose profiles were created prior to April 25, 2011 have now been set to “checked”. Since no profile information is shown to anyone unless this option is selected, our member directory was looking pretty empty until last night. This change means that all of our members are now sharing their profile information with each other unless and until they opt out. For new profiles, this had already been the default since late April. This change means that all members now show up in our public member directory, albeit with limited profile information. For new profiles, this is now the default. In the left sidebar, click “view profile“. For each piece of profile information, select the desired level of sharing: anybody (this information will be available to the general public), members (this information will be available only to fellow IAP2 USA members) or no access (this information will not be shared). Head to the private (member-only) member directory to verify your settings. Head to the public member directory to verify your settings (only information that you want to share with “anyone” should show here). Lather, rinse, repeat if necessary until you’re happy with the results!